Math anxiety is much more than a dislike for the subject—it’s a real problem for students, one that blocks the brain’s working memory and starts a self-perpetuating cycle of math avoidance, low achievement, and fear. This form of anxiety manifests as early as kindergarten, and nearly half of elementary school children experience it. Avoidance: Math anxiety and math avoidance go hand in hand. Do you have students who seem to grasp at any reason to leave the classroom during math instruction? This could be more than just a student trying to get out of work. Students with high levels of math anxiety tend to avoid mathematics at all costs. In class, this may look like misbehaving, off-task behavior, or frequent visits to the nurse. 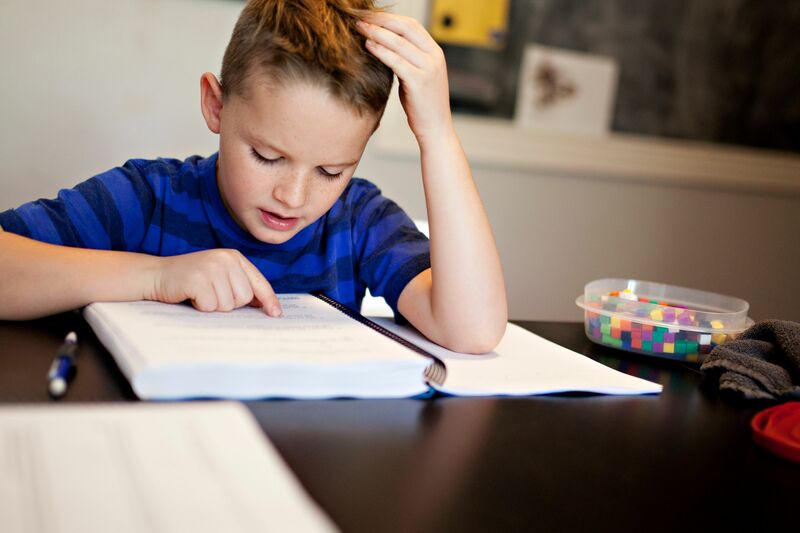 But avoidance may be hard to recognize because some of our math-anxious students have perfected the skill of doing very little math without drawing too much attention to themselves. Lack of response: Do you have students who seem to freeze when asked a question involving math? When students have math anxiety, any math-related question can make them feel extremely stressed. They lack full access to their working memory, making it nearly impossible for them to think clearly. They may even have this reaction when they know the answer—it’s the fear that is standing in the way, not the math. Tears or anger: Tears or anger might signal anxiety, especially if they appear only during math. Students with math anxiety tend to be very hard on themselves and work under the harmful and false assumption that being good at math means getting correct answers quickly. These beliefs and thoughts are quite crippling. Low achievement: Given that math-anxious students avoid math, it’s not surprising that this also affects their achievement. With less exposure to math than their peers, these students tend to do poorly on assignments and assessments. And students begin to see low grades as labels that verify their belief that they just can’t do math. Provide students with time to understand the why: It may seem like a good idea to help struggling students by focusing on procedures, but this may actually make things worse. Many math-anxious students tend to see math as a series of nonsensical steps that must be memorized. All students deserve the time to truly understand the math they’re being asked to do. Skipping this time shortchanges our students and gives them a joyless math—one requiring a lot of memory, repetitive steps, and anxiety. Use healthy and accurate messages: One way to support math-anxious students is to have regular class conversations about negative beliefs. Reassuring students that there’s no such thing as a math person, or special people born more capable in math, will reduce their anxiety and help them see themselves as mathematicians. The words that teachers use when conferring with students are also important. Praising students for correct answers, speed, or good grades does little in the way of providing useful feedback. On the other hand, using specific comments about processes students use to solve problems, their decision to represent the math in multiple ways, or their use of particular sense-making strategies encourages all students and makes the math accessible to all. Allow think time when asking questions: For a student with math anxiety, being asked a question in front of others can be an excruciating experience. On-the-spot questioning can also send the unintended message that mathematics is about quickly firing off answers. Giving students appropriate think time supports them in developing conceptual understanding and communicates that being fast at math is not the same as being good at it. Students do their best learning when they feel comfortable and safe. A fear that the teacher may call their name at any moment causes some students to focus on the fear instead of the math. If the worry of being singled out is removed, students will have the time and space to think deeply as mathematicians and, with time, may begin to volunteer their ideas. Use mixed-ability grouping: Struggling students are often put together in math groups in order for the teacher to give targeted instruction. But students rarely exit from these groups and often receive very different math instruction than their high-performing peers. And such groups can confirm the negative opinions some students have about their abilities. Heterogeneous grouping serves all students by giving everyone access to high-quality math and to different ideas and perspectives. And math tasks with multiple entry points are a great way to foster healthy problem solving that allows for students to share multiple methods and strategies.